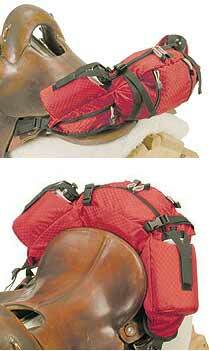 Made by Easy Care to fit any Western or Western/Endurance model saddle. Two 20 oz. water bottles are included or you can use your own. Attaches to the cantle of your saddle using webbed straps around your cinch ring or fender straps and tightens down for a secure no-bounce fit. Five zippered roomy compartments to organize and store your essentials. Two contoured and insulated water bottle holders. Foam-padded bottom panel lined with durable, soft, short-pile fleece to protect the saddle and the horse’s back from the weight of the pack’s contents. Nylon straps with reinforced tabbed ends. Extended nylon-tabbed zipper pulls for easy access to all compartments. Additional adjustable straps for tying down a coat or securing contents.